In addition to the theme, another important point to note is that this month’s Session is appropriately dedicated to prominent beer author, Mr. Michael Jackson (to whom all beer lovers owe a large debt of gratitude). So let’s see what animal Brewerman will contribute to the zoo. Kiuchi Brewery is located in Japan. 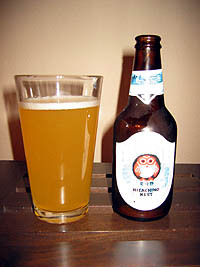 The iconic owl on the front is present on all the Hitachino Nest beers. It is one of the more distinct Japanese labels making this little bird easy to spot in the bottleshops’ coolers. This is one of their top selling beers for a reason. It’s an award-winner that people like. Let’s see what it’s all about. Appearance: Classic haze of a white. Straw color. White head that quickly dissipates. Smell: Whites are traditionally brewed with orange peel and coriander. This one appears to be no exception as the aroma is heavy on both fronts, but the coriander is coupled with an apparent nutmeg addition. Hops are not obvious or even apparent, which is to be expected for the style. Taste: Nice, heavy fruit and spice sitting on top of the classic wheat-heavy grain bill. It is a big, bright flavor that dissipates cleanly. Mouthfeel: Light and clean with lively carbonation that plays well with the flavor. So play nice with the other animals, little Hitachino Nest owl. Know that we’ll all be coming to visit you and your other Brew Zoo friends regularly.